This book tells, for the first time, the story of the Situationist International’s influence and afterlives in Britain, where its radical ideas have been rapturously welcomed and fiercely resisted. The Situationist International presented itself as the culmination of the twentieth century avant-garde tradition — as the true successor of Dada and Surrealism. Its grand ambition was not unfounded. Though it dissolved in 1972, generations of artists and writers, theorists and provocateurs, punks and psychogeographers have continued its effort to confront and contest the ‘society of the spectacle.’ This book constructs a long cultural history, beginning in the interwar period with the arrival of Surrealism to Britain, moving through the countercultures of the 1950s and 1960s, and finally surveying the directions in which Situationist theory and practice are being taken today. It combines agile historicism with close readings of a vast range of archival and newly excavated materials, including newspaper reports, underground pamphlets, Psychogeographical films, and experimental novels. 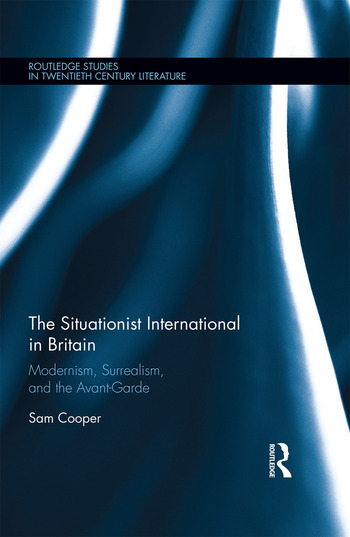 It brings to light an overlooked but ferociously productive period of British avant-garde practice, and demonstrates how this subterranean activity helps us to understand postwar culture, late modernism, and the complex internationalization of the avant-garde. As popular and academic interest in the Situationists grows, this book offers an important contribution to the international history of the avant-garde and Surrealism. It will prove a valuable resource for researchers and students of English and Comparative Literature, Modernism and the Avant-Gardes, Twentieth Century and Contemporary History, Cultural Studies, Art History, and Political Aesthetics. Sam Cooper is a Teaching Fellow in 20th Century English Literature in the School of English at the University of Sussex, UK.